For when you need to appease your hunger with something tasty and healthy, but do not want to go all out with your cooking, here’s a simple dish, infused with your favourite greens and chicken sausages to go well with a plate of rice. 1. Heat 1 tablespoon of olive oil in a non-stick skillet over medium heat. Add the pieces of Italian chicken sausages and let them fry for about 6 minutes, until it has browned on both sides. 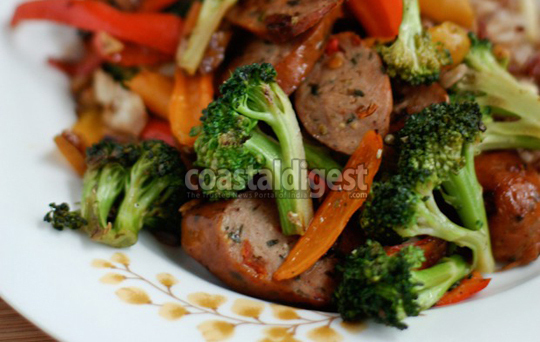 Take the Italian chicken sausages out of the pan and set aside on a plate. 2. Heat 1 tablespoon olive oil in the same skillet. Raise heat from medium to medium high. Add minced garlic, broccoli and capsicum to the pan and sauté for 3 - 4 minutes. Season with oregano, salt and pepper. Add the Italian chicken sausages back in the pan and gently toss, cooking together for another few minutes, until the vegetables are bright and slightly crisp. 3. Serve over a plate of rice or whole-wheat orzo pasta drizzled in olive oil, salt and pepper. Please note: use 2 teaspoons of oregano in the case of plain chicken sausages.